Description: This product is quick and easy to use. It cleans and enhances the shine of all vehicles and gives a tough wax film protection against corrosion. It is fully biodegradable. The product can also be purchased as a straight car washing shampoo without the wax. It is suitable for all vehicle users including bus and coach companies, haulage firms, bulk transporters and all motor cars. Directions: Dilute 1 part to 150 parts warm water. Apply the solution generously with a sponge cloth or brush. Rinse vehicles with clean water and allow to dry. Polishing with a soft cloth increases the shine. Available in 5, 25 and 200 litre plastic containers. Description: De-ices windscreens and cleans without smears. Prevents windscreen washers freezing in winter conditions. For use by: Garages, motor pools, haulage contractors, taxis, buses and emergency services. Directions: In summer dilute 1 part to 6 parts water. In winter above freezing use 1 part to 3 parts water and below freezing use 1 part to 1 part water. Do not use undiluted product on paintwork. Product is available in 5 litre plastic containers. Description: Product is supplied in trigger spray applicator. Spray product undiluted onto the effected area. Allow to penetrate and liquify the ice. Brush away with a cloth or squeegee. Use undiluted and spray on effected areas. Product is supplied in 1 litre plastic containers with trigger spray applicators attached. Description: A specially formulated product to clean and brighten aluminium and its alloys. Effective on vehicle bodies and removes industrial grime and stains. A safe effective cleaner and brightener of aluminium. Use on building, in kitchens and on vehicle bodies and wheels. Directions: Dilute 1 part to 4 parts hand hot water. Brush the solution onto the surface to be cleaned starting at the bottom. Then thoroughly agitate the surface with a brush to remove loose dirt. Rinse off thoroughly with clean water. Do not allow to dry out on the surface. Product available in 5 litre plastic containers. Description: A fast drying alcohol formalation. Leaves no greasy film and non smearing. Removes static from VDU's. Description: A low foam product which leaves no sticky deposits and helps prevent resoiling. 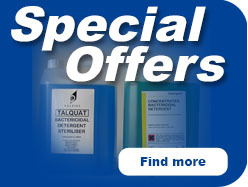 Has a solvent added for rapid and effective cleaning and is ideal as a prespotting solution. Suitable for woven and non woven carpets of synthetic and natural fibres. Test a small patch to ensure suitability before use. 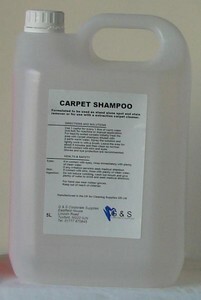 1 litre will clean approximately 20 square metres of carpet. Directions: Dilute 1 part to 20 parts cold or warm water. Use in a water extraction cleaner. For prespotting spray on neat and agitate, then leave for 2 minutes and absorb any excess moisture on paper or an absorbant pad before going over the area with an extraction machine. Product available in 1, 5 and 25 litre plastic containers. Description: A fast acting and free rinsing detergent specially formulated for curtain sided vehicles, box type lorrys and buses. It is suitable for use in hard or soft water areas. Suitable for use through pressure washing machines using either hot or cold water. Used extensively in the transport industry. Nb Not suitable for use on aluminium or galvanised surfaces. Directions: Pour TFR into the detergent tank of the pressure washer. Adjust the feed rate as required it may be diluted up to 1 part to 200 parts water. Lightly prespray the whole vehicle using low pressure then remove dirt and traffic film using even sweeps of the lance at high pressure and close range up to temperatures of 70 degrees. Turn off the detergent feed and rinse the vehicle thoroughly with clean water. Product supplied in 5, 25 and 200 litre plastic containers.